At one time, not too long ago, St Paul was a force in the beer brewing scene of the Twin Cities and all of Minnesota. Downtown St Paul had many breweries along the river and the biggest of them all which was just up the street, in the legendary Eastside neighborhood. When you had breweries, you had bars that went along with them called tied houses and one of those old bars has just been reborn. St Paul Eastsiders, Eric Foster and Bob Parker, thought that most of the action is currently on the other side of town, so why not bring it back to where it began? In 1885 a man by the name of Magnus Lindstrom built a two story building on St Paul’s Eastside and ran a saloon on the main floor while living in the above apartment. A block away was a beer brewery called Hamm’s. After slinging beer and hooch for a few years, Magnus was eventually made an offer, by Theo Hamm company, that he couldn’t refuse. The saloon became a Hamm’s tied house and the rest is history…or was it? Prohibition soon came into play and root beer and other non alcoholic drinks were sold until 1933 when prohibition ended and the beer started flowing again. Around 1938 Hamm’s decided to sell the property to a real estate company which continued it as a bar until 1968 when it then became rental units. Later it would fall into disuse, and it stood vacant for 17 years until it bought with the intention of turning it into a coffee shop in 2003. Are you still with me? Enter modern times: The coffee shop never quite materialized. the Craft Beer and Minnesota beer scene is gaining steam and becoming a newborn version of it’s former self, and 858 Payne Avenue has become Ward 6 Bar and Restaurant. Eric and Bob have recruited Liz Olson of Barbette and Pat’s Tap fame to become the head chef, and with a crew of talented and enthusiastic people it looks to already be a success. I have stopped in twice so far, once for the brunch and again for the dinner menu. Both are pretty good and they offer more choices of food than your typical bar. You can expect to find such things as Pork Ribs, Dijon Pasta, Cicero Stew and even a Charcuterie Plate; then you will have a selection of rotating soups and don’t get me started on deserts! 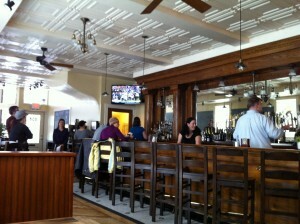 Of course, being a craft beer bar you will also find a very large selection of brews. On tap you’ll find 19 different local beers and one out of state import. And if you are wondering, Hamm’s beer is flowing once again It is physically impossible for me refuse a two dollar glass of Hamm’s, so I went for it. A large section of the bar is the original hand carved bar that has been restored to it’s former glory. Also the beer prices are great! Any glass of all beer selections are just three dollars and pints are five dollars. Hamm’s is just two dollars for a glass. Most bars don’t even give you the choice of small glasses for less… It’s five or more dollars you have to pay before you realize you don’t even like the beer you ordered. 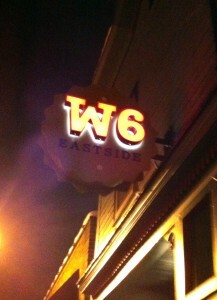 I really like the look and feel of Ward 6. It is like stepping back in time in your own neighborhood. The decor inside and out is amazingly retro. Even the sinks in the bathroom add a touch of class. 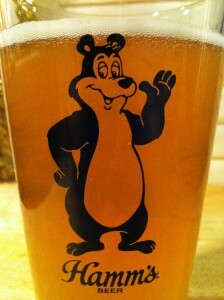 And if you are lucky enough the Hamm’s bear may make an appearance when you are there. The eastside is alive with the sound of craft beer!